At only 14 years old, Carol demonstrates a drive to succeed beyond that of most other kids her age. She was a well-respected leader in her primary school, and is recognized by her Catholic church leaders as a very dedicated young lady who spends a lot of time at the church helping out with chores. Carol visits the church often because of the tense situation at home – she was born to a young single mother who later married. In rural Kenyan communities, blended families such as Carol’s often never fully integrate; the added pressure of having to take care of a spouse’s child in addition to the rest of the family often puts strain on these families. This unfortunate situation has inspired Carol to take her studies very seriously, so she can someday support herself and her entire family. 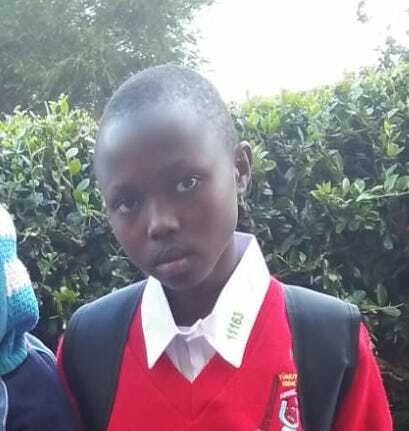 She worked very hard in primary school and earned a score on her KCPE high enough to be accepted to Tumutumu Girls High School in her neighbourhood, which is one of the top national high schools in the country. Though this was a great victory, there was no way Carol’s family would be able to raise the necessary amount to pay for her school fees and supplies. Though her church was concerned, they already had fundraising activities lined up and were unable to help Carol continue her education. In the face of all these obstacles, Carol took it upon herself to visit the high school to reserve her position until a time that she would be able to pay the school fees. Luckily, Moja Tu was visiting Tumutumu High School at this time. Carol’s principal referred her case to us, and after a brief interview and validation visit, we agreed to take Carol into our program. Now, Carol doesn’t have to worry about her school fees, and can focus on what’s truly important: doing well in her new high school. She has already demonstrated her desire to be in school and rise above the tense circumstances at home. Carol knows that the only way to improve her life is to succeed in school. We can’t wait to see this amazing young girl grow and help her reach her full potential. Thank you for sponsoring Carol’s future!